The Millennium Hall Gartocharn was the venue for the Installation of the new Provincial Grand Master Brother John McKenzie Past Master Lodge Loch Lomond No. 1483, Provincial Grand Junior Chaplain and his commissioned team on 11 June 2005. A fine installation on a beautiful summer day was performed by the Most Worshipful Grand Master Mason Brother Reverend Joseph J. Morrow and members of Grand Lodge. The fine sum of £2,500.00 was presented to Grand Lodge on the day. Brother Thomas McDonald Past Master Lodge Ben Cleuch No. 782 was honoured by the Grand Master Mason in November 2005 when he received the Honorary Grand Rank of Architect. Fitting tribute was paid to Brother John McLeod Sneddon at the Regular Communication held on 31 January 2006 when the announcement of his death was made by the Right Worshipful Provincial Grand Master. Brother Sneddon had served as Right Worshipful Provincial Grand Master from 1995 to 2000. Stirling Council approached Provincial Grand Lodge in April 2006 expressing their concern at the deteriorating condition of the Christies Clock, Allanpark, Stirling and proposing a joint venture to carry out restoration works. Two brethren took up the challenge as contained in the following article. For further details of the Restoration of the clock click the S&C. Brother Archibald Blair Treasurer of Lodge Stirling Royal Arch No. 76 was honoured for his services to freemasonry in November 2006 when the Grand Master Mason awarded him the Honorary Grand Rank of Assistant Treasurer. Lodge Callendar No. 588 enjoyed a Celebration Dinner at 7.30 pm on Friday 03 November 2006 in recognition of it having occupied the Masonic Temple, 5 Lint Riggs, Falkirk from 1906 – 2006. The possibility of organising an Annual Divine Service in 2008 was floated by the Provincial Grand Master at the Regular Communication held in January 2007. In recognition of his valuable and dedicated services to Provincial Grand Lodge and Grand Lodge over many years, Brother Colin T. Wyse Past Provincial Grand Master was presented with a Distinguished Service Membership Certificate at the AGM held on 28 February 2007. Brother Wyse thanked the Right Worshipful Provincial Grand Master and the members of Provincial Grand Lodge for the honour bestowed upon him and also those who had supported him throughout his Masonic career. Grand Lodge had taken the decision to close the Masonic Homes, ‘Ault Wharrie’ and ‘Ardnablane’, Dunblane in 2005. The accommodation standards required by law had become more and more onerous necessitating an expensive and in many cases impractical upgrade of both homes. It was therefore decided to market the sites so bringing in welcome income to Grand Lodge. The demolition of both homes was carried out in August 2007 as a precursor to private residential homes being built on the sites. It is interesting that a plaque mounted on a stone gate pillar and displaying the Grand Lodge crest was recovered and presented to the Lodge of Dunblane No. IX just before the bulldozers completed their work. The Lodge of Alloa No. 69 marked their 250th Anniversary with a Re-dedication Ceremony held in Alloa Town Hall on 10 November 2007. Brother Sir Archibald D. Orr Ewing Most Worshipful Grand Master Mason and a deputation of Grand Office-bearers carried out the ceremony in front of a large attendance of brethren. This was followed by a Celebration Dinner held in the Dunmar House Hotel, Alloa. Brother Thomas Proctor Past Master of Lodge Buchanan Killearn No. 1419 was the recipient of the Honorary Grand Rank of Director of Ceremonies in November 2007. The distinct honour of being made Honorary Grand Senior Deacon was conferred upon Brother Alexander Birrell Past Master Lodge Clackmannan No. 1303, Past Substitute Provincial Grand Master in the same month. It was resolved at the beginning of 2008 that Provincial Grand Lodge would hold an Annual Divine Service and that a Social Sub-Committee would be set up to organise an Annual Dance or similar such function. On the 02 March 2008 the first Divine Service was held in Denny Old Parish Church when Lodge St. Andrew (Denny & Loanhead) No. 176 acted as host Lodge. The service was lead by the Reverend John Murning. This was followed on Friday 11 April 2008 by a Dinner Dance held in the King Robert Hotel, Stirling. The annual recognition for services to freemasonry went to Brother Alexander Montgomery Past Master of Lodge St. John Slamannan No. 484 when he was made Honorary Grand Bard in November 2008. Provincial Grand Lodge were set to have a busy year in 2009 when a number of daughter Lodges were to celebrate special occasions. Lodge Zetland No. 391 celebrated its 150th Anniversary on 07 February 2009 when a Service of Re-dedication was carried out in their premises in Grangemouth. This was followed by a Ceremony of Consecration in the new premises at Dirleton Lane, Alloa of The Lodge of Alloa No. 69 on Saturday 28 February 2009. Thereafter Lodge Stirling Royal Arch No. 76 celebrated their 250th Anniversary on Saturday 23 May 2009. The marquee of the Stirling County Rugby Club, Bridgehaugh Park, Stirling was the venue for the Rededication Service and the Anniversary Dinner to follow. The Right Worshipful Provincial Grand Master Brother John McKenzie and his team of Commissioned Office-bearers officiated on all three occasions. The working tools presented to The Lodge of Alloa No. 69 by Lodge Bannockburn Bruce and Thistle No. 312, on the occasion of their 250th Anniversary. Lodge Stirling Royal Arch No. 76 was thrilled to celebrate its 250th Anniversary at 2.00 pm on Saturday 23 May 2009 in the marquee of Stirling County Rugby Club, Bridgehaugh Park, Stirling. A Rededication Ceremony was conducted by Office-bearers from Provincial Grand Lodge headed by the Right Worshipful Provincial Grand Master Brother John McKenzie assisted by Brother Reverend John Harley Jenkinson Senior Provincial Grand Chaplain. A meal for nearly two hundred brethren and visitors afterwards enjoyed an excellent dinner chaired by Brother Alexander Morton Right Worshipful Master. To celebrate the 250th Anniversary of receiving its Charter, Lodge Stirling Royal Arch No.76 released a new Mark Penny. This showed the 'old' Lodge seal of a wolf crouching on a crag. On the Reverse was the present Lodge seal. The penny was in gold coloured metal. Both badges were enameled. The death of Brother Doctor Hector C. Campbell M.B.E., M.B., Ch. B., M.R.C.G.P., Past Master Lodge Buchanan Killearn No. 1419, Past Provincial Grand Master (1971–1975) was announced at the Regular Communication held on 29 April 2009. Brother Henry C. Malcolm Past Master of Lodge Dolphin No. 911, Past Substitute Provincial Grand Master was honoured by the Grand Master Mason by being awarded the Honorary Grand Rank of Junior Deacon in November 2009. A similar honour was bestowed on Brother H. Graeme Russell Past Master Lodge Camelon No. 1456, Past Provincial Grand Secretary who was awarded the Honorary Grand Rank of Assistant Secretary. Provincial Grand Lodge was graced by the presence of the Most Worshipful Immediate Past Grand Master Mason at the AGM held on 24 February 2010. The Right Worshipful Provincial Grand Master Brother John McKenzie presented Brother Sir Archibald D. Orr Ewing Bart., M.A. with Honorary Membership of the Provincial Grand Lodge of Stirlingshire. Saturday 12 June 2010 marked the end of yet another five year term when the commission of Brother John McKenzie Right Worshipful Provincial Grand Master came to an end. He was succeeded by Brother Andrew A. McKinnon Past Master Lodge Callendar No. 588, Past Provincial Grand Master Depute. Brother McKinnon chose to be installed in his Mother Lodge. The ceremony was carried out by the Most Worshipful Grand Master Mason Brother Charles Iain R. Wolrige Gordon of Esslemont and his team of Grand Lodge Office-bearers. A cheque in the sum of £3,000.00 was presented to Grand Lodge to be allocated to the Grand Lodge Benevolent Fund. The Grand Master Mason saw fit to confer the Honorary Grand Rank of Sword Bearer on Brother Archibald Mackay Past Master Lodge St. Andrew (Denny & Loanhead) No. 176 in November 2010. It was suggested at the Regular Communication of 25 January 2011 that Provincial Grand Lodge consider running a Charity Fishing Competition along similar lines to the successful Charity Golf and Charity Bowling Competitions that had been staged for many years and had resulted in significant sums of money being donated to deserving causes. One of the characters of freemasonry in the Province of Stirlingshire sadly passed to the Grand Lodge above in January 2011. Brother Ian McIntosh Past Master Lodge Camelon No. 1456, Honorary Provincial Grand Bible Bearer died at the age of 103 years. Brother Ian was a stalwart of Provincial Grand Lodge and supported it for many years. Fishermen from all over the Province congregated at Buckieburn Reservoir, Denny on Saturday 04 June 2011 for the first Provincial Grand Lodge Charity Fishing Competition. A good day was had by all and a fine cheque in the sum of £1,500.00 was presented to Erskine Homes as a result of the anglers efforts. It was the turn of Lodge St. John Falkirk No.16 to enjoy one of those special moments in Lodge history. Brethren congregated in the Lodge on Saturday 01 October 2011 to celebrate their 275th Anniversary and enjoy a Re-dedication Ceremony. The Right Worshipful Provincial Grand Master Brother Andrew A. McKinnon and Brother John Harley Jenkinson Senior Provincial Grand Chaplain officiated. A fine Celebratory Dinner was thereafter held at the Cladhan Hotel, Falkirk. Once again the Grim Reaper came into the Province in October 2011 when Brother Alfred Stewart Fenwick McGhie Past Master Lodge St. Servanus No. 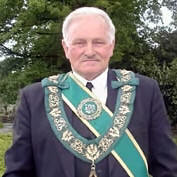 771, Past Provincial Grand Senior Warden passed away. Brother Freddie had served Provincial Grand Lodge as a Member of the Board of Grand Stewards from 2000 – 2011. There were two recipients of Grand Lodge honours in November 2011. They were Brother James Hayworth Master Mason Lodge Dolphin No. 911 who was awarded the Honorary Grand Rank of Organist and Brother Alexander Plank Past Master Lodge Abercromby No. 531 Past Provincial Grand Senior Warden who was awarded the Honorary Grand Rank of Bard. The twenty-first playing of the Provincial Grand Lodge Charity Golf Competition took place at Ross Priory Golf Course on Sunday 12 May 2011. The Competition started in 1991 and has raised more than £60,000.00 for various Charities over the years. Lodge Ladywell No 1474 celebrated their 60th Anniversary on Saturday 8th September 2012. The occasion was marked by an Entered Apprentice Degree being carried out by Brother Andrew A. McKinnon and Office-bearers of the Province of Stirlingshire. During the ceremonial Brother Ronald Hay PM Lodge Ladywell No1474 was made an Honorary Provincial Grand Junior Deacon by Brother McKinnon. Brother McKinnon was himself surprised to be made an Honorary Life Member of Lodge Ladywell No 1474. An Anniversary Dinner was held in the Lodge rooms after the Meeting. Brother Thomas Grieve Past Master Lodge Polmont No. 793 was awarded the Honorary Grand Rank of Director of Music by the Grand Master Mason in November 2012. It was with sadness that members of Provincial Grand Lodge learned of the death of Brother Peter Easton Past Master of Lodge Zetland No. 391 at the age of 87 years. Brother Peter was a Past President of Grand Stewards, Past Provincial Grand Master Depute and Honorary Grand Senior Deacon. The annual Reigning Masters Degree was hosted by Lodge Ladywell No. 1474 in April 2013 when the company was especially graced by the presence of the Most Worshipful Grand Master Mason Brother Charles Iain R. Wolrige Gordon of Esslemont and Grand Secretary Worshipful Brother David M. Begg. Lodge Buchanan Killearn No. 1419 was obliged to seek the assistance of Lodge Strathendrick No. 780 in 2012. The Village Hall that had been their home since 1947 was due to undergo a major refurbishment lasting nearly one year and it required a temporary meeting place. Through the co-operation of the Balfron Lodge its meetings were held in Balfron in 2012 and early 2013. Lodge Strathendrick No. 780 had previously come to their aid in 1954 when a similar premises refurbishment took place in Killearn. This latter change of premises was a success in many ways so much so that the Lodge took the decision to move to Balfron permanently. This was ratified by Grand Lodge and Provincial Grand Lodge approving appropriately amended Bye-laws changes on 10 May 2013. The Right Worshipful Provincial Grand Master conferred the Honorary Provincial Grand Rank of Architect on Brother Joseph Sharp P.M. Lodge Callendar No. 588 at the Lodge Regular Meeting held on Monday 02 September 2013. Brother Andrew A. McKinnon Right Worshipful Provincial Grand Master was totally surprised to be made an honorary member of Lodge Buchanan Killearn No. 1419 at the Lodge Regular Meeting held on Thursday 19 September 2013. The members of Lodge Loch Lomond No. 1483 celebrated its 60 Years Diamond Jubilee with a re-dedication ceremony held in the Millennium Hall, Gartocharn on Saturday 21 September 2013. The ceremony of re-dedication was performed by the Right Worshipful Provincial Grand Master and members of Provincial Grand Lodge. Some 96 brethren from inside and outside the Province enjoyed the occasion and the celebration dinner that followed. Brother Andrew A. McKinnon Right Worshipful Provincial Grand Master received the honour of being made an honorary member of the Lodge. It was Brother Andrew A. McKinnon’s turn to surprise Brother James F. Fisher P.M. Lodge Stirling Royal Arch No. 76 at the Regular Meeting of the Lodge held on Monday 21 September 2013. Brother Fisher was awarded the Honorary Provincial Grand Rank of Bard for his many years service to freemasonry. Surprises were the order of the day at Lodge St. Servanus No. 771 at the Regular Meeting held on Monday 21 October 2013. Past Provincial Grand Master Brother Colin T. Wyse was presented with a 65 Years Service Certificate by Right Worshipful Provincial Grand Master Brother Andrew A. McKinnon in his Mother Lodge. Not to be outdone however Brother Wyse presented Brother McKinnon with a Certificate of Honorary Membership on the same night. The Most Worshipful Grand Master Mason conferred the Honorary Grand Rank of Senior Deacon on Brother Hugh B. Edmond P.M. Lodge Strathendrick No. 780 at the Annual Meeting of Grand Lodge in November 2013. Brother James Mackie P.M. Lodge Camelon No. 1456 was also awarded the Honorary Grand Rank of Jeweller at the same meeting. Brother Alexander (Sandy) Whitehead P.M., Past Depute Grand Master, Past Provincial Grand Master was presented with a 65 Years Service Certificate in Lodge Ancient Stirling No. 30 at the Regular Meeting held on 21 January 2014. A number of his distinguished colleagues from Grand Lodge were in attendance together with many representatives of Provincial Grand Lodge. Grand Lodge abolished further Life Memberships at the Regular Meeting held on 06 February 2014 so allowing Lodge Commutation Funds to be wound up. Lodge Polmont No. 793 conferred honorary membership on the RWPGM Brother Andrew A. McKinnon at the Regular Meeting of that Lodge held on Wednesday 23 April 2014. There was much local activity in the summer of 2014 when Stirlingshire recognised and commemorated the 700th Anniversary of the Battle of Bannockburn (23 and 24 June) and many local Organisations celebrated this event in different ways. The Provincial Grand Lodge of Stirlingshire marked the occasion by staging a commemorative dinner and dance in the marquee of Stirling County Ruby Club on 31 May 2014. Some 220 members, guests and friends enjoyed the event. A commemorative token was struck bearing the head of Robert the Bruce on one side and the crest of the Provincial Grand Lodge of Stirlingshire on the other. The company was enhanced by the presence of the Most Worshipful Grand Master Mason, Grand Secretary, the Depute Lord Lieutenant of Stirling and Perth and Doctor Elspeth King Director of the Stirling Smith Institute. The latter gave an excellent after-dinner address on the significance of the battle to all Scots and to Freemasons. Freemasons from all over Scotland descended on the Allan Church of Scotland on Friday 20 June 2014. Members of Lodge Bannockburn Bruce and Thistle No. 312 and those from Lodge Stirling Royal Arch No. 76 marched in regalia from their Lodge to the church. The Most Worshipful Grand Master Mason had more lavish transport when he literally dropped in by helicopter to visit the Province for the third time in 2014. Lodge Bannockburn Bruce and Thistle No. 312 hosted a reigning Right Worshipful Provincial Grand Master’s Entered Apprentice Degree to mark the 700th Anniversary of the Battle of Bannockburn. Eighteen reigning Right Worshipful Provincial Grand Masters from various Sister Provinces conferred the degree ceremonial on the son of the Master of the host lodge. A fine collection of £855.00 was taken to be dispensed to Charities by the choice of the host Lodge. The Right Worshipful Master Brother James McCormick took the opportunity to confer honorary membership on the Right Worshipful Provincial Grand Master Brother Andrew A. McKinnon at the end of the evening. The Right Worshipful Provincial Grand Master conferred the Honorary Provincial Grand Rank of Grand Organist on Brother John Bell P.M. Lodge St. Andrew (Denny and Loanhead) No. 176 on Thursday 11 September 2014. He followed this up by conferring the Honorary Provincial Grand Rank of Grand Director of Ceremonies on Brother William Reid P.M. Lodge Stirling Royal Arch No. 76 on Monday 22 September 2014 in recognition of their service to the Craft. Brother Alexander Crocket P.M. Lodge Craiginnan Dollar No. 850 was honoured by Grand Lodge in November 2014 when he was made Honorary Grand Senior Deacon. Saturday 13 December 2014 saw Brother Colin Terris Wyse, Past Provincial Grand Master, installed into the Chair of Lodge St. Servanus No. 771 at the age of 85 years forty-nine years after he was first installed in 1965.